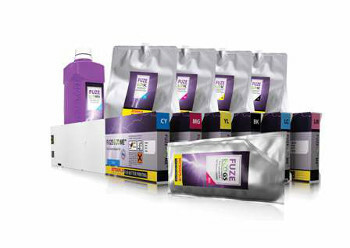 FUZE ECO family Bordeaux Digital Printink has released details about the launch of new custom made inks and solutions compatible with the latest Roland Pro4™ and Epson SureColor S™ wide format digital printers at FESPA Munich, Germany 20-23 May 2014, Hall B2 Stand 340. The company develops and markets inks for wide and super wide digital printers such as Roland ™ , Mimaki™, Mutoh™, HP™, Seiko™, Epson, Agfa/Gandi, Dilli and Jeti printers and for all latest printhead technologies such as Xaar, Konica Minolta, Epson, Spectra, Toshiba and more. 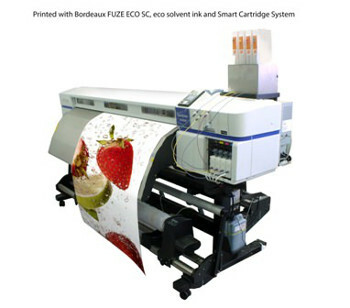 At the exhibition, Bordeaux will showcase its new FUZE ECO PR4™, designed for Roland’s SOLJET PRO4 printer. The company pointed out that this mix & match, low odour ink is compatible with Roland's Eco-Sol MAX2 ink and supports the Roland’s SOLJET PRO4 XR-640, XF-640 and VersaCAMM VSi™ high printing speeds. Additionally, it will also launch a 700ml cartridge with dedicated chip for Epson® SureColor™ S-series printers. This is a solution using FUZE ECO SC™ ink which is again a mix & match with OEM, designed to preserve ink quality as well as allowing the user to swap from OEM to Bordeaux cartridges quickly, one colour at a time, without requiring any pre or post preparations. Bordeaux believe it is the most convenient solution in the market today. Epson SureColor S with graphic Other solutions which will be demonstrated include its Dye Sublimation transfer inks, EDEN ST™, on a Mutoh RJ-900x and Bordeaux’s Latex ink, EDEN LX™ on a Mimaki JV33 printer installed with an Epson DX printhead. Bordeaux will have its sales and marketing staff on hand at the show to provide visitors with information on a variety of wide format technologies such as ECO/Mild solvent, UV/UV LED curable inks as well as coatings, laminates and adhesion promoters. “Bordeaux continues to support the wide format market with quality driven solutions to OEM inks. I believe that Bordeaux proved its ability to achieve new goals and the solution for the latest Roland SOLJET PRO4 printer and the Epson SureColor S printers are just examples," said Moshe Zach, CEO of Bordeaux.